I admit: I was a tad grumpy as we food bloggers (Mattatouille, Gourmet Pigs, Eating LA, FoodGPS) headed out from Santa Fe on an almost-deserted stretch of freeway that at one time was known as Route 66. Where were we going? Why would a restaurant be all the way out here? It’s hot. It’s not a fluke that the restaurant – always a mom and pop diner – had been open since 1953 and had existed longer than I-25 itself. The name is derived from the fact that the staffÂ used toÂ feed the bobcats that came from the hills at the back of the restaurant. The low ceiling with its wooden planks were evocative of the diner’s longevity, as was the unique charm of the room’s stylings. This was an extremely tasty, juicy ground chuck – which is apparently ground daily and is comprised of a decades-old recipe. 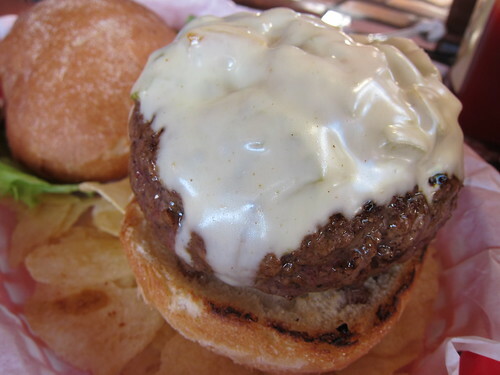 The bun was no detail, with it perfectly toasted on the outside and having a soft texture in the center. 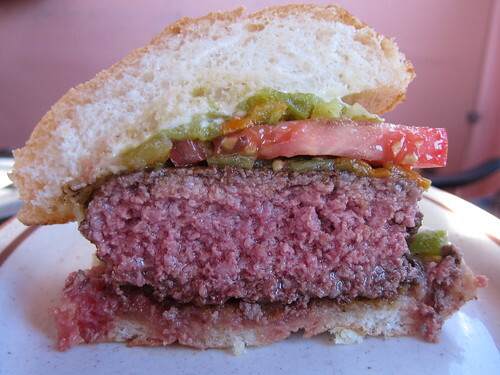 Who knows if you’ll ever be in New Mexico – but this burger, or its cheeseless, chile-less counterpart (no – not even the green chile burger itself), which is #12 on Alan Richman’s list of “20 Burgers You Must Eat Before You Die” would be well worth the trip if you happen to be anywhere near Santa Fe.